BANGI, 7 Dec 2012 – The National University of Malaysia (UKM) has proven that doing business need not mean profit alone, but it can also help the needy. 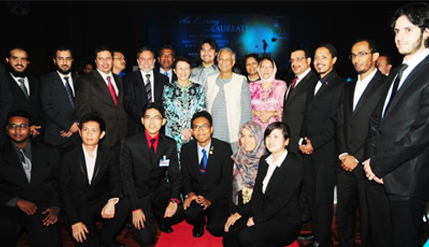 Nobel laureate and UKM’s Laureate-in-Residence, Professor Dr Muhammad Yunus said the university proved that Social Business can work outside his home country of Bangladesh. Launching the UKM Yunus Centre for Advancement of Social Business (UKM–Yunus CASB) at a Gala dinner in Bangi this evening, Prof Yunus said in social business enterprises the main focus is on solving social problems and not merely for profit. The dinner was also a fund-raiser for the UKM–Yunus CASB organised by the Centre for Entrepreneurship and SMEs Development (CESMED-UKM). Also present was UKM Vice-Chancellor Prof Tan Sri Dato’ Wira Dr Sharifah Hapsah Syed Hasan Shahabudin. The first step towards solving many problems affecting the world today is to dissociate from the obsession of making money since so long as one remains devoted to making money, the mind won’t be thinking of solving all the problems, he said. Prof Yunus, the Nobel Peace Prize winner in 2006 and the founder of Grameen Bank in Bangladesh, said universities provide the grounds for young people to see the benefits of social business enterprises. Money making is an incentive but making other people happy is an even bigger incentive. In fact, making others happy is super happiness, he said. He suggested that young people should be allowed to have a taste of both these experiences and then decide which is best. He hoped the UKM-Yunus CASB will play a role in studying, advocating and catalysing social businesses in Malaysia. He mentioned several successful social business initiatives carried out in Bangladesh, including the collaboration with French food company Danone to address malnutrition among children as well as a partnership with Adidas to provide shoes for poor people. He related how Grameen teamed up with Group Danone to create a yogurt fortified with micronutrients to decrease malnutrition for the children of Bangladesh. The yogurt is produced with solar and bio gas energy and is served in environmentally friendly packaging. In another venture, Grameen and Veolia Water combined their complementary skills to make clean and safe water accessible to villagers in the poorest parts of Bangladesh, where, for essentially geological reasons, almost all of the groundwater is contaminated with arsenic, very often at levels that make it a health hazard. When Adidas asked him for a motto that would promote the company globally, he responded with, “Nobody in the world should be without shoes,” and challenged them to make shoes that would cost just one euro a pair. They baulked at this at first but eventually came up with a product costing less than one euro. He cited this as another example that should spur the younger generations to think outside the box. Prof Muhammad Yunus, born in 1940, is a banker and economist. He was a professor of economics where he developed the concepts of microcredit and microfinance. These loans are given to entrepreneurs too poor to qualify for traditional bank loans. 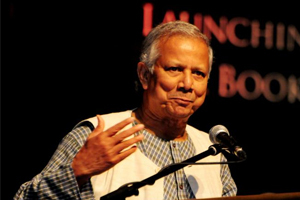 In 2006 Yunus and Grameen received the Nobel Peace Prize “for their efforts through microcredit to create economic and social development from below”. He has also received several other national and international honours.